In drawing together the various strands we first need to ask how catastrophic, as opposed to merely calamitous, the various mass-extinction events were. As was indicated in Chapter 3, there is no way in which the stratigraphic record can ever provide dates that are precise to within less than a few thousand years. Thus, the connection between a bolide impact and a catastrophic phase of extinction lasting no longer than a few years could never be established with a high degree of confidence from the record of the strata alone. All that can be done is to establish a pattern that is consistent with such a scenario. As was also pointed out in Chapter 3, a change that is drastic enough over an interval of a few thousand to a few tens of thousands of years can reasonably be described as catastrophic in the context of normal patterns of geological change extending over millions of years. Several events seem to qualify unequivocally: the end-Permian, the end-Cretaceous, and, on a smaller scale, the end-Palaeocene, which affected only one group of deep-sea organisms. It needs to be added, though, that the end-Cretaceous event seems to have been the culmination of a phase of increased extinction rates among a wide variety of organisms. Such patterns of catastrophic change cannot yet be ruled out for the other mass-extinction events, but decisive evidence is not yet forthcoming. A more gradual or multiple pattern of extinctions appears to be more likely for the end-Ordovician, late Devonian, and end-Triassic extinctions and also for more minor ones such as those in the early Jurassic and mid-Cretaceous. Catastrophic coups de grfice are quite possible, if not probable, as culminating factors for some of these events, but more detailed collecting and statistical work across the world is required to put forward a stronger case than has been made so far. So, naturalists observe, a flea Hath smaller fleas that on him prey; And these have smaller fleas to bite 'em, And so proceed ad infinitum. As has been mentioned in Chapter 4, Sheehan and Hansen have put forward an interesting hypothesis to explain selective extinctions at the K-T boundary associated with impact, but we must now consider what patterns can be discerned for mass extinctions in general. resistant or extinction-vulnerable. On the basis of his comprehensive studies of late Cretaceous gastropod and bivalve molluscs Dave Jablonski has argued that wider geographic distribution prior to the K-T mass extinction conferred greater resistance to it. This seems a reasonable enough conclusion, but whether or not it is generally true for the Phanerozoic as a whole has not yet been convincingly demonstrated; Jab-lonski's findings have indeed been challenged by some research workers. Another generally held belief is that organisms with a tropical distribution are more vulnerable to extinction than those occupying higher latitudes. This seems to be true of reef-building organisms, both corals and calcareous sponges, from early Cambrian times onwards. However, Raup and his student George Boyajian have demonstrated that extinction rates for reef taxa (the quintessentially tropical taxa) are not proportionally elevated relative to other so-called 'level bottom' taxa during mass-extinction intervals; this argues against latitudinal bias. Furthermore, Raup and Jablonski undertook an analysis of end-Cretaceous bivalves from this point of view. Only one major group of tropical bivalves, the rudists, disappeared at the K-T boundary (just before, in fact), but no other relationship between palaeolatitude and extinction could be recognized. Perhaps the most easily measured features of a fossil taxon is the maximum size of its individual members, and fortunately this may have considerable biological significance. To state that larger organisms of a given species, genus, or family are more vulnerable to extinction seems to be one of the best generalizations that can be made at present. It has been reckoned, for instance, that no animal of weight greater than 25 kilograms survived the K-T extinction. That larger animals should be more vulnerable to extinction makes good sense. Larger animals are more likely to be rarer and breed less frequently. Both these factors will in all probability reduce their chances of surviving an environmental crisis. One of the better generalizations in palaeobiology is that of phyletic size increase through time, or Cope's Rule, named after the distinguished American vertebrate palaeontologist Edward Drinker Cope, who competed actively in the late nineteenth century with a rival, O. C. Marsh, in hunting for dinosaurs and large Tertiary mammals in the American West. Throughout the animal kingdom, from minute foraminifera to huge mammals, there is a tendency for the maximum size of the individual organisms in a given taxon to increase more or less gradually through time. This does not appear to be matched by an equivalent gradual tendency to size decrease. This does not mean that evolution is always towards larger size; if that were the case, the world would be almost exclusively inhabited by giants. Clearly there are likely to be many adaptive advantages for some organisms in becoming smaller, but the change would appear to have been relatively sudden, and cannot be recognized as a whole sequence of progressively smaller fossils through a succession of strata. The changes in size may relate to differing adaptive strategies. Although like all biological generalizations it has been challenged, one of the more useful ones that has resisted total dismissal is that of what are called r and K adaptive strategies. The letter 'r' is used to denote the reproductive rate of a given organism; 'K' signifies the carrying capacity of the environment. An animal with a high r will reproduce at a relatively rapid rate and mature early, attaining, in consequence of a reduction in its growth rate with adulthood, a maximum size of only modest dimensions. On the other hand, an animal with a high K is likely to reproduce more slowly, mature later, and attain a greater maximum size. Small size and high reproductive rate are characteristics of organisms living in a stressed environment which have an opportunistic lifestyle. They are adapted to take full advantage of limited opportunities for survival, whether of food resources or some other aspect of a fluctuating environment. What are termed 'K-selected organisms', on the other hand, can depend on a more stable environment and can therefore invest in quality rather than quantity in their reproductive strategy. This pattern of change should relate well to Ager's 'long periods of boredom interrupted by moments of terror'. The moments of terror are the drastic changes in the environment which lead to mass extinctions, both major and minor. It follows that the organisms surviving these events should tend to be of small size for given taxa. This is indeed supported by what is normally found in faunas that lived in the immediate aftermath of extinction events. The phenomenon has been graced by a name, the Lilliput effect. One can accordingly propose a model. As stable conditions are restored, there is an adaptive premium on living longer and growing larger. But there is a natural built-in check on this process. Making the reasonable assumption that food resources are approximately constant, as organisms of a given species or genus grow larger they must perforce become rarer, so increasing their vulnerability to extinction during the next 'moment of terror'. I put this model to the test some years ago by comparing two groups of abundant Jurassic molluscs, the ammonites and bivalves. These two groups had very different evolutionary characteristics. The ammonites both radiated and went extinct at a much more rapid rate than the bivalves, giving a much higher rate of taxonomic turnover through time, which makes them much more valuable as biostratigraphic indicators. To make the point more vividly, it is not too fanciful to compare these molluscs with two types of horses. The ammonites were the thoroughbred racehorses, dashing and exciting, but temperamental creatures highly vulnerable to injury or disease, whereas the bivalves were the shire-type carthorses, more stolid and plodding but very trustworthy, environmentally more resistant dobbins. The principal result of my study was to find that phyletic size increase among the faster-evolving ammonites took place at a correspondingly more rapid rate. I consider that this provides at least gratifying support for my model. It follows from this study that, since ammonites evidently became extinct 'at the drop of a hat', so to speak, being vulnerable even to minor environmental disturbances, they are less valuable to us in our endeavour to discern the more significant disturbances than the more stolid bivalves. If many bivalves became extinct at a particular stratigraphic horizon, that must reflect that something really big happened. What is true for bivalves is likely to have been true for many other benthic invertebrates, because ammonites are exceptional in having such a high rate of evolutionary turnover. After mass extinctions, the earliest phases of recovery tend, indeed, to be dominated by geographically widespread groups of small-sized organisms that occur in low diversity but high individual abundance. In consequence, one or a few species will totally dominate the fauna or flora and can occur in huge quantities. These are sometimes called disaster taxa and are thought to have had an opportunistic lifestyle. The end of the recovery phase commonly coincides with the reappearance of organisms that seemed to have disappeared at the extinction horizon, the Lazarus taxa. This must signify that these taxa had found some undiscovered refuge in which to survive until environmental conditions improved again, or that they became so rare after the extinction event that their apparent absence in the directly overlying strata is due to our failure to find fossils. A brief survey of recovery phases after the major extinction events will give some idea of what evidently happened. After the loss of the archaeocyathan sponges (a group with calcareous conical skeletons) following the major mass extinction that occurred late in early Cambrian times, metazoan reefs did not rebound until some 25 million years later, in the earliest Ordovician of China, with the appearance of bryozoans (a group of colonial organisms) and two groups of sponges (the stromatoporoids and lithistids, with calcareous and non-calcareous skeletons respectively). In contrast, non-reef marine ecosystems quickly rebounded well before the end of the Cambrian period. pods, which are thought to have been environmentally tolerant opportunists. With the subsequent rise of sea level in early Silurian times there was an increase in taxonomic diversification, but little biological innovation is evident at this time. Lazarus taxa among the brachiopods, trilobites, and cystoid echinoderms (which were the dominant echinoderms in the Cambrian and Ordovician) have been recognized in Middle Silurian faunas following the Lower Silurian, which was relatively depauperate (i.e. low in diversity). In the case of the late Devonian mass extinctions, rugose corals and stromato-poroid reefs disappeared dramatically, and reefs did not reappear until well into the Carboniferous. Nearshore marine environments seem to have suffered fewer extinctions than those farther from the shore, and were a source of the eury-topic survival faunas of the final Devonian stage, the Famen-nian. Permian. (The reefs were composed of calcareous sponges belonging to a group, the Sphinctozoa, that consisted essentially of Palaeozoic survivors, and Scleractinian corals, a new group that had evolved after the rugose corals of the Palaeozoic died out at the end of that era.) 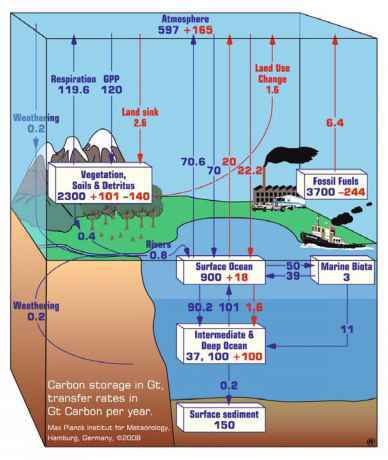 There is thus a postextinction coal gap as well as a reef gap in the stratigraphic record. Since the silica-skeletoned radiolaria also underwent mass extinction, there is a corresponding chert gap, because chert is formed by the reprecipitation of silica after dissolution of siliceous organisms, such as radiolaria, diatoms, or siliceous sponges. Early Triassic land reptiles were also depauperate, being dominated by the cosmopolitan Lystrosaurus. It thus took at least six million years before the world's biota began to recover fully from the end-Permian catastrophe and underwent the most complete ecological reorganization since the Ordovician radiation. The end-Triassic extinction, in contrast, does not seem to have caused any drastic reorganization of ecosystems, except that once again reefs were drastically reduced, and the sphinc-tozoan sponges finally disappeared. The marine faunas of the earliest Jurassic, Hettangian, stage were limited in diversity, most organisms being small in size for their taxa, but by about two stages later, about 15 million years after the end of the Triassic, diversities were substantially restored and extensive reefs had reappeared. With regard to the end-Cretaceous extinction, the earliest stage of the Tertiary, the Danian, is characterized by a survival interval at the start which is dominated by a single species of the planktonic foraminifer Guembelitria, a small, opportunistic form that rapidly expanded its geographic range in the absence of competition and quickly diversified. All subsequent planktonic foraminiferans are descended from this species and a second surviving species in another genus. By one to two million years after the mass extinction this group had begun to make a full recovery. The most detailed record of temporal change for land organisms comes from the plants. Several centimetres of basal Tertiary strata in North America are dom inated by fern spores, indicating a classic type of opportunistic regeneration following severe ecological disruption. During 1.5 million years after the mass extinction angiosperm-dominated assemblages had undergone a full recovery, but this had probably begun only a few hundred thousand years after the extinction event. The deep-sea assemblage of benthic foraminifera that collapsed during the end-Palaeocene extinction event was succeeded for 100,000 to 200,000 years by a survival assemblage characterized by taxa that could survive low oxygen conditions. This assemblage was in turn succeeded by a recovery interval dominated by the migration of opportunistic taxa from shallow waters.